Here is something I wrote for SEOUL Magazine last year on the food in Andong, along with some extra pictures. I visited there with Jen Flinn, Roboseyo, Matt from Popular Gusts and a great group. Stayed in a beautiful country inn. You can read about the adventure itself here. To look at the original piece in the magazine, click here and go to page 53. This month Seoul Food is going on a trip. Believe it or not, Seoul is not the beginning and the end of Korean food. Regional cuisine can be starkly different, even from Seoullite interpretations of those regions. Part of this trip was inspired by a bad experience at a chain jjimdalk restaurant in Seoul. This stewed chicken dish satisfies in cold winters. Yet this one franchise restaurant mixed it with not only seafood but seafood that reeked of freezer burn. That’s the end of the franchise restaurant experience. Can the real Andong jjimdalk pleasingly stand up? The best place to get good Andong jjimdalk follows one of the basic rules of finding great food in Korea—go to the markets. Open air markets tend to have restaurants that take advantage of their access to fresh ingredients. For some reason, they follow that funky business practice of opening multiple restaurants all serving the same thing in one small space, whether it’s the awesome fish restaurants at Noryangjin Seafood Market or the little alley of sundae bokkeum joints at Anyang Central Market. The competition creates opportunities for the diner willing to forego the white tablecloth experience for the sake of good food. The Andong Gu Market in the city’s downtown area boasts an area called “Chicken Alley.” This is the beating heart of the best jjimdalk in the world. A big line of restaurants with oversized flame-licked woks bubble thick blackish sauces. A good jjimdalk comes in a sauce that’s almost black, not orange or brown. One restaurant was so tiny that the only room for the restroom sign was on the beverage cooler. Yet the food transports you to another place. Jjimdalk is festive food. It can’t be made for single diners. Ample platters come out loaded with tender stewed chicken pieces, thick cut leeks, carrots and root vegetables, sweet potato noodles, chili peppers and a rich sauce that is slightly sweet and garlicky, bringing it all together. Eating jjimdalk is also a messy affair. Don’t wear a white shirt. Twenty years ago, turkey producers marketed turkey cold cuts by challenging the notion that Americans could only eat turkey during Thanksgiving and Christmas. Heot jesa bap takes a similar tact. It literally means “Fake Ceremonial Food” and is the closest one could call an everyday version of ancestral ritual food. Someone figured it was something people could eat without waiting for a relative to pass away. For a tourist, this is a little window into Korean private life. How many outsiders get invited into Korean homes when they are honoring the anniversary of a loved one’s death? They don’t. Yet Andong restaurants give a sense of what the food is like. It’s a lot of food, too. Vegetables, radish soup, little fried bits and pieces, fish and more dishes spilling over the table. The main differences between this food and other grand Korean meals are the nicer tableware and the lack of hot chili peppers. The food is gentle to appease the spirit. This is also true of the Andong-style bibimbap that is included in heot jesa bap. It doesn’t include fiery red gochujang unless it’s requested. It uses a seasoned soy sauce instead. The whole meal is a blessing to someone who is cursed with a sensitive tongue when it comes to peppers. It’s also proof that not all Korean food has to be slathered in red to be tasty. 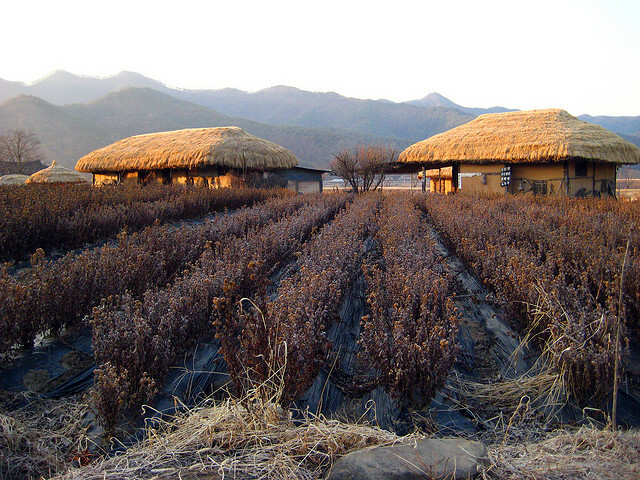 Yet one delicacy in Andong is red where it isn’t anywhere else—sikhye. The sweet mysterious rice punch that is sometimes served at the end of a garlicky meal takes a different hue in these parts by means of red chili powder, ginger and a longer fermentation period. It’s an exciting beverage that seriously should be marketed in convenience stores countrywide. Another Andong specialty that is sometimes included in the heot jesa bap is gan godeung-eo, or super, super salty mackerel. Since Andong is a good means inland, fishmongers heavily salted their mackerel to preserve it for the trip to the historic Confucian center. Don’t be scared off. It is something to be tried and savored. Even people who don’t like fish have found this one to be a favorite. It’s meaty and filling. Of course, how can one do a piece on Andong fare without mentioning the famous Andong soju? Seoul Food has mentioned it once before when talking about soju in general, but here’s a recap. It’s the best. There. Oh, you want more? Okay, it’s the real soju. It’s made from rice. It’s not only high in alcohol, it actually has a deep complex flavor that only comes from skillful fermentation. The soju you get for cheap in the green bottles is usually just pure grain alcohol mixed with flavorings. It tells you something when Korea’s versions of Martha Stewart suggest putting a spray nozzle on a bottle of convenience store soju and use it as a dry cleaning solution. That green bottle stuff has some harsh chemicals. Yet it does get the cigarette and charcoal smell out of the dinner jacket. Andong’s soju craftspeople are upholding a tradition of spirit production brought from the Middle East to Korea by way of the Mongols. That itself is worth a “konbae” or two. A little bakery opened in downtown Andong in 1974 that has become a cherished institution. The braniacs behind the chain Korean cake chains should come down to Mammoth Bakery and take notes. Hey, this may be one of the few cases when a little corporate espionage would be a good thing, as long as it meant that the wonders that come out of Mammoth’s ovens can be enjoyed throughout South Korea. Mammoth doesn’t do the usual trick of vaguely mimicking a French bakery with a Korean touch. It is a French bakery with a Korean touch. It takes the best of both worlds and refines them, creating beautiful creatures of baked goodness. Real macarons. Sacher torte garnished with gold leaf. Black tea chiffon cake. Housemade marshmallows. Sandwiches that aren’t mayonnaise bombs in between stale white bread slices. It is heaven for the non-gluten-sensitive! They also make a mean cup of coffee and have real jazz piping gently through the speakers. Keep in mind, this is in Andong. It is hardly another planet. It’s a destination—a little Brigadoon of traditional flavors and smart innovation. Oh yeah, there are sites to see, and the Hahoe Folk Village is a cool little place to crash for the night. The food will bring you back.